The increasing popularity of football during the pre-war period led companies, such as Littlewoods, to produce ‘pocket annuals’ in order tap into the growing market. It was hoped they would build reader loyalty and boost company’s profiles, so it can be seen that these little books were an early form of loyalty marketing. Annuals, such as this one from 1937, provided a synopsis of the previous campaign, a selection of statistics, as well as an overview and the fixtures of each club for the upcoming season. 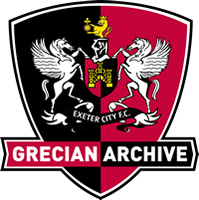 The overview for Exeter City carries a pretty positive tone, which is perhaps kind given that the Grecians finished the previous season at the bottom of the Division 3 South table. The new manager, Jack English is given a lot of praise for his shaping of the new look City side, with the author of the article stating that ‘given that there was no money to spend… he has done the right thing in going for youth to supersede age.’ Going for youth… It’ll never catch on!